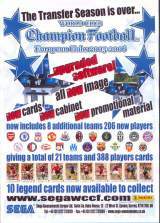 World Club Champion Football European Clubs 2005-2006 © 2006 Sega Enterprises, Limited. Runs on the Sega "Naomi 2 Satellite Terminal" Hardware. This game was released in Japan on August, 17, 2006. It was added teams from the French Ligue 1 and German Bundesliga.